Angina is due to the narrowing of the coronary arteries, the vessels that supply your heart with blood. The arteries become furred up with plaque and fatty deposits which restrict blood flow, this process is called atherosclerosis and leads to coronary heart disease. Angina symptoms generally include (but are not conclusive) pain or a heavy feeling in the chest and breathlessness, this can be accompanied by a choking feeling. These Angina symptoms often occur during exercise and have also been associated with stress. Angina symtoms can be more prominent after exercise, a meal or during cold weather, anger as well as stress also tends to make it worse. Angina is a combination of symptoms caused by restricted blood flow in the arteries leading to the heart. The pain is often described as tightness in the chest or a heavy weight feeling, it doesn’t usually last more than a few minutes and can disappear after resting for a while. As well as the pain, you may feel breathless, sweaty and have a sense of fear. Indigestion and angina are often confused as the symptoms are very similar. 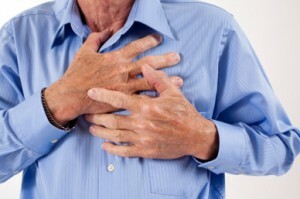 Angina pain may not be limited to the chest, it can spread to the arms, neck and throat. Plaque in the arteries limits the blood flow and attaches itself to the walls, blood can become so thick and hard to circulate that the heart will be under undue stress. Stable angina is when the symptoms become predictable and regular and you have experienced this for over a couple of months. Angina symptoms of the stable type usually develop gradually over a period of time, often you will notice a pattern to the symptoms. Maybe you only experience these Angina symptoms when you do physical exercise or if you happen to be under a lot of stress. Stable Angina symptoms generally pass within a few minutes of rest. Unstable angina is generally caused by the narrowing of a coronary artery, this could mean that you are at an increased risk of heart attack or stroke. Unstable Angina symptoms often materialise after only a small amount of effort or even when resting. Quite often there is not a pattern to the symptoms and it can be that they last for 30 minutes or even more. It can also be that the pain develops quickly and is more severe than stable angina. If you get a sudden chest pain or you think you have unstable angina symptoms you should call for emergency help immediately. Medications such as aspirin will thin the blood making it easier to pass through restricted or blocked arteries, this will ease the symptoms of angina but not the root of the problem. Chelation Therapy together with a diet and exercise regime can actually help to reverse the effects of arterial blockage and heart disease.